LANCASTER – Individuals and organizations can help celebrate local military heroes by sponsoring banners, which will be prominently featured along The BLVD in 2013. The banners will display pictures of Antelope Valley residents who have served in a combat theater during a time of war including: World War I, World War II, Korean War, Vietnam War, Gulf War and the War on Terror. For rules regarding the application process, visit the Hometown Heroes page on the city’s website at www.cityoflancasterca.org/hometownhero. Lancaster launched The BLVD Community Program in November 2010, offering residents and business owners the opportunity to make a piece of the revitalized BLVD their very own. 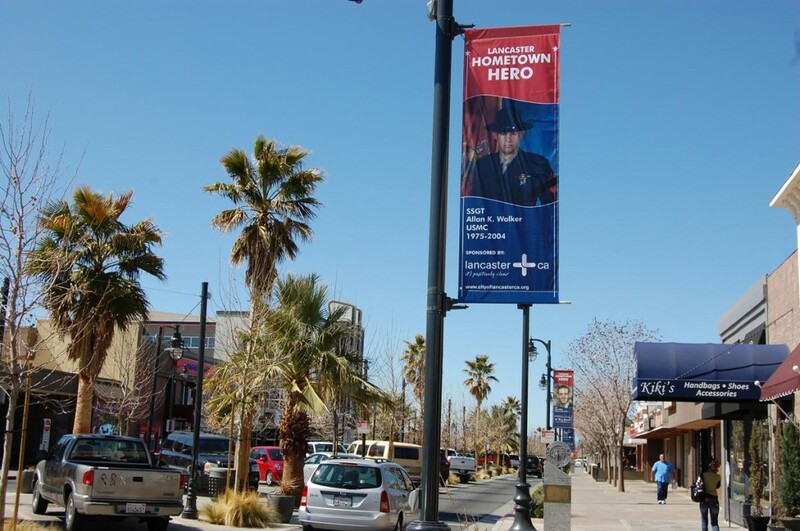 Seeing that these banners could be used for so much more than festive holiday décor, Mayor R. Rex Parris encouraged City Staff to develop a “Hometown Heroes” banner, to pay special tribute to local servicemen and women. Sponsors can become a part of this year-long marketing opportunity for $100 a month. Sponsorships of four or more are discounted. Applications for the program are due by Friday, January 11, 2013. For more information, contact Nicole Nutt at 661-723-6173 or nnutt@cityoflancasterca.org. Applications can also be picked up at City Hall, Parks Recreation & Arts Department or downloaded online at www.cityoflancasterca.org/hometownhero. 11 comments for "Sponsor a Hometown Hero on The BLVD"
Department as they already have on call helicopter availability), simply ground the R.Rex Parris golden bird, and use the funds to pay for putting up the memorial banners complimentary free of charge to the deceased Veterans families, whom in many cases have already paid the ultimate price in blood, for their loved ones sacrifice for our Country, County and City …..
As s Veteran, I want to thank the City of Lancaster for recognizing and appreciating hometown heros. I am thankful that our city honors those that have given so much to us. I hope that the city continues this program and finds the best ways to do it. Maybe it is not perfectly implemented, but at least it is being done! How low can the “Boulevard’s” exploitation of veteran’s go? Come on, where talking Rex here. You read my mind. Conservatives love to ‘use’ the military and veterans to prop themselves up. Liberal democrats are good for it also when they have never served in the military and only serve themself. Democrats love to take your freedom away and spread lies and propaganda. Free your mind from the party of evil. Gotta pay for that eye in the sky someway. Great idea Adam Chant. Also, once a banner has been made, a family can sponser for whatever period of time they chose, and the city could put up city sponsered banners in it’s place untill another is found. The same family could later do it again with the same banner. I’m going to comment in objection to this with the intent of opening a dialog about the usage of these banners. First, I support the concept of the banners and support our military especially our Hometown Heroes who have in many cases given their lives to protect our freedoms including my right to free speech. The banners are up and down the extent of the redeveloped BLVD and can only be used to promote the Hometown Heroes program. There are also about a dozen of the banners used to promote city sponsored BLVD events when they take place; Celebrate America, BooLVD, BLVD Christmas, etc. Any individual or business in the community can sponsor a Hometown Heroes banner so this is not just a matter of a BLVD centric issue. Where I have issue is that the VAST majority of the banners are currently sponsored by the City of Lancaster and the Law offices of R Rex Parris. If this is intended as a money making opportunity for the City of Lancaster then I suggest that (at least) the banners that are sponsored by the City of Lancaster be used to just promote local businesses in the downtown area. No Hometown Heroes banner just a BLVD banner that points to parking, businesses on each block and maybe even a few arrows showing the businesses off the main of the BLVD. Additionally there are way more nominated Heroes every year than sponsors so maybe the program can be updated quarterly instead of annually. Then more Heroes can be recognized and instead of a sponsorship costing $1200 it would only be $300. The city of Lancaster wants so bad for the BLVD to be a success, but more times than not with their programs they actually have little to no understanding of how it will effect small businesses in the downtown area. How low can the City of Lancaster bend to promote the BLVD than to clearly exploit the memory of deceased veterans at a cost to the families when the City should recognize these heros and pay for the “banners”. Next they’ll be exploiting our local fallen heros who sacrificed their lives in the line of duty such as LASD Deputy Stephen Sorenson and LAFD Arnie Quinones. Shame on you City of Lancaster. Think about this for about 10 seconds. Why do you think the majority of them are being sponsored by Rex or the City? It’s because NOBODY IN THE BUSINESS COMMUNITY WANTS TO HAVE ANYTHING TO DO WITH REX OR THE CITY!! This is the same guy that says he’s going to “out” businesses that don’t prosecute shoplifters (how many are there anyway?). If you talk to the vast majority of businessowners, they don’t want anything to do with him. Probably because businesses are the organizations he likes to sue because they’ve got the bucks. He does all kinds of stuff to stifle business in the area then acts like he’s doing business owners a favor by allowing them to decorate his boondoggle?